We all set goals in our personal lives: how much weight we want to lose, how much money we want to save, where we want our lives to be in five or 10 years. But, when it comes to business, it turns out that we’re not nearly as goal-focused. Even though, as entrepreneurs, we’ve taken on big risks to start new businesses, the surprising truth is that we’re really not very good at goal setting at all. What’s more surprising is how much of an impact setting goals and tracking your progress can have on your business. A recent study by Censuswide and Geckoboard looked at over 250 small and medium-sized businesses in the U.S. and the data exposed the secret to business success: setting growth targets and tracking your progress dramatically increases your chances of actually reaching your goals. 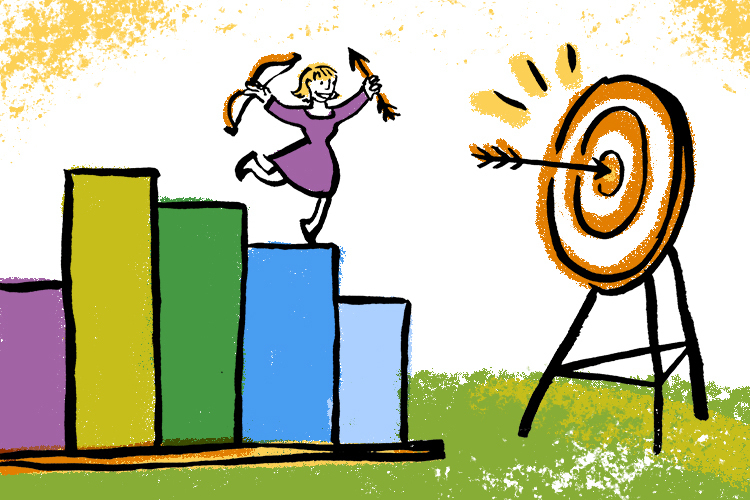 It turns out that one in 10 small businesses have no growth targets at all. And only one out of 10 small businesses that do have growth targets track those goals in real-time. These businesses that don’t set or track their goals tend to stay small: 77 percent of them report less than $100k in annual revenue. In contrast, the businesses that do set goals and track progress are much more successful. Businesses that set and track their goals hit some of their goals 96 percent of the time and 41 percent hit all of their goals—that’s nearly twice as good as businesses that don’t regularly track their progress. Just the simple act of setting a goal and then tracking your progress can have a remarkable impact on your business. Not only are you more likely to achieve your goals, but other research shows that you will actually grow faster—up to 30 percent faster—than a business that doesn’t set goals. Setting goals and tracking your progress toward those goals can have a substantial impact on your business. But, there’s even more to it: How you track your progress also impacts how successful you will be. The research shows that companies that track their goals in real-time are twice as likely to hit all of their goals in a 12 month period. In fact, the more frequently you check in on your progress toward your goal, the more likely you are to succeed, according to research from the American Psychological Association. However, the vast majority of companies (70 percent) don’t have the ability to track their goals on a daily basis. It’s not enough to just set goals and track your progress. You can unlock another level of growth for your company by sharing your goals with your team. According to the Censuswide and Geckoboard survey, companies said that the single most important factor contributing to business growth is having every employee understand the key objectives of the company. Companies that don’t share their goals and their progress are less likely to leverage their team to help them achieve their goals, and don’t grow as fast as companies that do share their goals with their team. The good news is that there’s a lot you can do to increase your chances of success with your business. Unlike many things in business that you can’t control, setting goals and tracking your progress is not one of them. Start by setting your goals for revenue and create a budget for expenses. Track your progress to make sure you’re reaching your sales goals and staying within your budget. Don’t be held hostage by your goals, though. If the initial goals you set for your business aren’t quite right, just adjust them and move forward. Once you have a solid comfort level with your basic sales and expense goals, try tracking a few additional metrics like cash in the bank, accounts receivable, or accounts payable. You can also expand beyond financial metrics and track other aspects of your business such as sales leads, table-turns in your restaurant, or visits to your website. The key is to take advantage of this hack that will help you run your business better and grow faster. It’s likely that your competition isn’t tracking their goals, so you can get an immediate leg up in the market simply by setting some goals and tracking your progress.